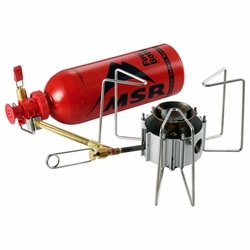 The MSR DragonFly liquid-fuel camp stove takes precision-simmering performance and puts it in a chassis that’s built to handle a variety of fuels and the frequent use dished-out by global vagabonds. Tough and stable, it excels in institutional and guide service settings. The Dragon Fly's dual-valve design gives you the flame control you need for evenly heating large pots (up to 9" maximum diameter) of crowd-pleasing gruel. Of course, when the need arises to melt snow and brew-up fast, the DragonFly goes from zero to searing at the twist of a knob. Full Flame Control: First ever dual-valve design offers an unrivaled range of flame control—simmer to boil with a twist of the flame adjuster.